Whether you are contemplating how to resolve a dispute or you find yourself defending a lawsuit, Nair Law LLC can help provide practical, reasoned advice and a plan to win in and out of court. Nair Law focuses on minimizing your costs and advancing your interests through meticulous legal research, precise legal drafting, and by devoting sufficient resources to resolve any issues. Altogether, Nair Law cuts right to the heart of the issue and works on the best strategy for you to get what you need. 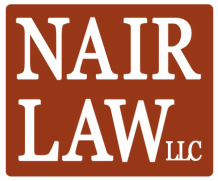 Nair Law specializes in all forms of disputes, including environmental issues, contractual issues, intellectual property litigation, and landlord/tenant disputes. Please don't hesitate to contact the firm! Small, large, straightforward, or complex, Nair Law can handle all types of cases and welcomes the opportunity to work with you. Litigation can be a long process; be sure that you like and, especially, that you can trust your attorney. Nair Law bases its practice on correcting the top three ethical issues with attorneys: billing, communication, and handling of client money. As a 21st Century law firm, Nair Law offers reasonable rates through a progressive billing system that provides for free case updates and brief client communications. As a client, you will get electronic PDF invoices detailing how much time was spent on specific activities on your behalf. You can trust Nair Law LLC to deliver the highest of quality work product with your bottom line in mind. © 2013-2016 Nair Law LLC. All Rights Reserved.